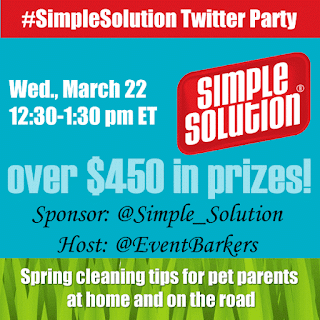 The #SimpleSolution Twitter Party is sponsored by Simple Solution. As always, we only share information we feel is relevant to our readers. Simple Solution is not responsible for the content of this article. We're getting ready for spring to bloom here in Atlanta and with that comes thoughts of spring cleaning and out with old and in with the new! And that means some freshening up of flooring and carpet, and being prepared for any pet messes and spills that may come our way. So it's perfect timing for a sneak peek at some of the great new products for cleaning and behavioral issues that Simple Solution will launch at Global Pet Expo on March 22. You'll be able to learn all about them, as well as some simple cleaning tips at the Event Barkers #SimpleSolution Twitter party on Wednesday, March 22 at 12:30 p.m. ET. 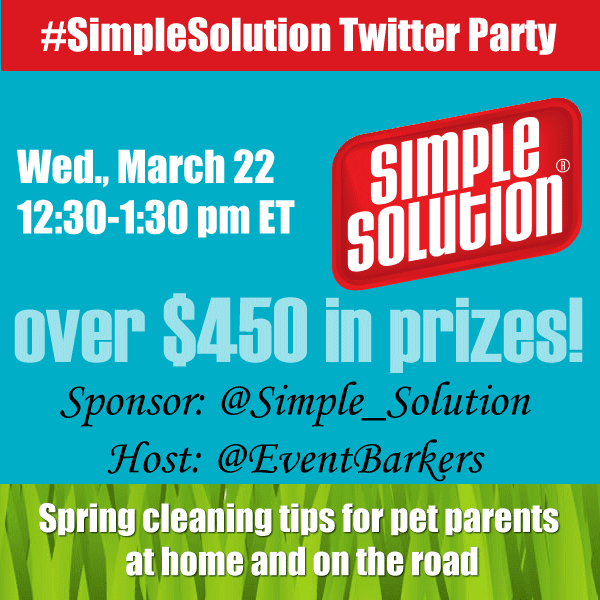 We hope you'll join us, along with our co-hosts @DogTipper, @CatTipper and sponsor @Simple_Solution, where we'll share news of the new products, #SimpleSolutions for pet parents and great prizes! Read all the way down to RSVP for the party and enter for a chance to win a pre-party prize pack! You won't want to miss this Twitter party from Simple Solution! As the experts in stain and odor cleaning, with 30 years of science behind them, Simple Solution has the strongest oxy fighting and enzymatic technology in the market. And that means they make it super simple for pet parents who want to maintain a clean and healthy home environment in the minimum amount of time. As with all our Event Barkers parties, we’ll be kicking off the fun with the announcement of the pre-party giveaway winner–and you don’t have to be present to win! You’ll enter for the pre-party prize in the widget at the end of this post. Then, every 10 minutes throughout the party, we’ll be giving away Simple Solution prize packs of their great cleaning and behavioral products, specially selected for your home, whether you share that home with dogs, cats, or both! The party will wrap up with an extra large grand prize pack so we know you’ll want to stick around for the 60 minutes of fast-paced fun. To be entered to win during the party, all you need to do is to participate in the fun by tweeting, retweeting, sharing cute photos of your pets, and asking your cleaning questions for the Simple Solution team. 25% discount on SimpleSolution.com from March 15 – March 31. @DogTipper will ask questions. Watch for Q1, Q2, etc. and answer with A1, A2, etc. @ToDogwithLove will share cleaning tips and facts about Simple Solution dog products. @CatTipper will share cleaning tips and facts about Simple Solution cat products. @Simple_Solution will be on hand to tell you more about Simple Solution products and to answer your cleaning questions! We hope to see you at the #SimpleSolution party! Remember: even if you can’t make the party, or you’re not on Twitter, you are eligible to enter the pre-party giveaway below. To RSVP and enter to win a $100 prize pack of Simple Solution cleaning products specially selected for YOUR pet household, enter in the widget below. You don’t have to be present to win the pre-party prize. Good luck!